Billy Wilder's inspired POW comedy Stalag 17 is being spruced up and given the Masters of Cinema treatment by Eureka for its Blu-ray debut next week, which is splendid news for fans of this sorely underrated masterpiece. The fact that a film as funny, humane and self-evidently important should so often be overlooked just speaks to the quality of Wilder's overall body of work. Following in the wake of Double Indemnity (1944), The Lost Weekend (1945), Sunset Boulevard (1950) and Ace In The Hole (1951), and with The Seven Year Itch (1955), Some Like It Hot (1959) and The Apartment (1960) still to come, it's no wonder it gets forgotten. 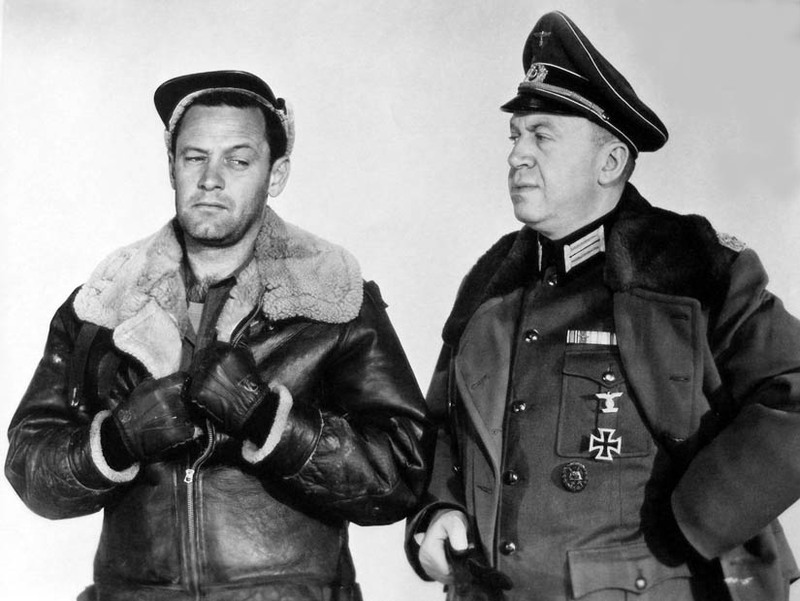 Taken from a Broadway play by Donald Bevan and Edmund Trzcinski, Stalag 17 concerns the antics of a gang of US airmen held in a Nazi prison camp on the Danube and is an astonishingly light-hearted film for Wilder to have made on the subject. The director, an Austrian Jewish émigré to the States, knew the reality of Europe's concentration camps intimately having shot Death Mills in 1945, a shockingly matter-of-fact documentary about their liberation following the Allied victory. For the public good, Death Mills presents the bare facts of the Holocaust and doesn't flinch from showing footage of bulldozers ploughing heaps of human corpses into mass graves. It remains a gruelling film to sit through, even with a running time of just 22 minutes. 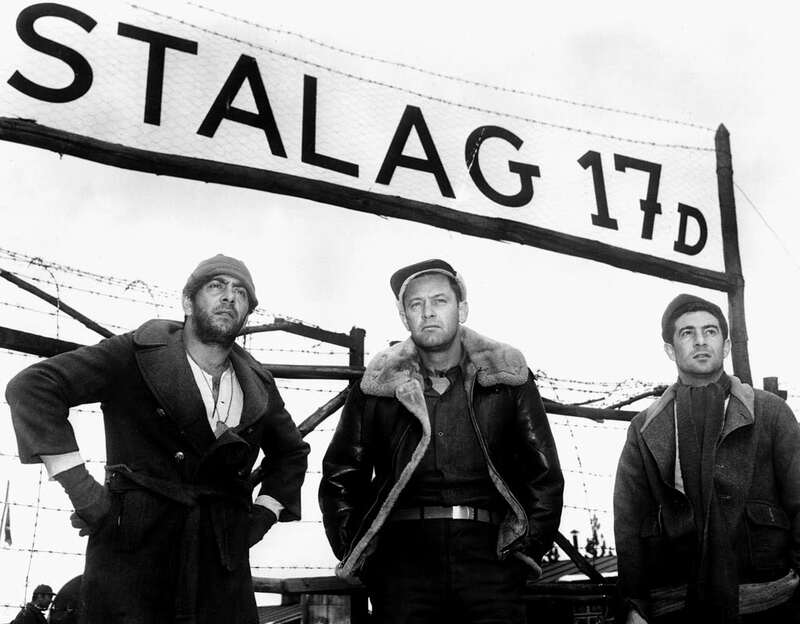 There's nothing quite so stark in Stalag 17, which is after all concerned with the detainment of American combatants - nominally protected by the Geneva Convention - rather than European civilians rounded up for genocide, but that's not to say it doesn't have its horrors. Less interested in the mechanics of breaking out than The Great Escape (1963), which seems utterly infantile by comparison, Stalag 17 deals primarily with the captives' attempts to keep up their spirits by improvising entertainments where they can and dreaming of their lives back home. The likes of Shaprio (Harvey Lembeck), a savvy Brooklynite, and Stanislas "Animal" Kuzawa (Robert Strauss), a wild-eyed horndog with the hots for Betty Grable, spend their days betting on the outcome of mice races, playing volleyball, listening to the radio and spying on the Russian girls' bathing hut next door. The gang's horseplay is tolerated by the sinister Colonel von Scherbach (played by noir director Otto Preminger) and positively indulged by the fatherly Bavarian guard Johann Sebastian Schultz, (Sig Ruman, a specialist in comic Germans and a veteran of Lubitsch and the Marx Brothers). Their games are amusing but always freighted with sadness. Wilder never lets us forget that these poor devils are desperately contriving distractions for themselves in order to avoid having to face the grim reality of their plight. The film's opening, in which two US sergeants are viciously gunned down after worming their way under the compound's barbwire fencing, remains lodged in our thoughts. That incident proved beyond doubt that the Yanks have a spy in their midst and the search for the identity of this double-agent drives the narrative. The group quickly singles out one J.J. Sefton (William Holden) for the stool pigeon, accusing Sefton of passing notes to the Germans in exchange for preferential treatment. Sefton is a wheeler-dealer, a Bogartian cynic embittered by his experiences and grown selfish, concerned only with his own welfare. Like Bogie's Rick Blaine in Casablanca (1942), Sefton must be persuaded to step back into the spotlight, rejoin the cause and fight the good fight - and only does so after he's been wrongly accused and his hand forced. His eventual escape and entrapment of the guilty party is a cause for celebration, not least because it hails Sefton's own moral rejuvenation, even if it means the villain meets the same grizzly fate as the men he betrayed. This is the brutal world of war, Wilder reminds us, the perfect end note to this most sensitively judged of black comedies.